In 2018, we finished a thirty-minute documentary call Appalachian Chair Caning and Story Telling, which KET, our state PBA affiliate was kind enough to pick up. It began airing in December 2018, with four showings in that month, and more scheduled in the future. The documentary covers the process of caning a chair seat from the initial foray into the woods to fell a hickory tree and strip its inner bark through the process of preparing the bark and weaving the chair seat. For those who can't access KET, the documentary is on this website, and also can be located by searching on the internet for YouTube Dean Cornett. In 2014, we finished a thirty-minute documentary called Sugar Cane, Sorghum, and Stir-offs, which KET, our state PBS affiliate, was kind enough to praise and pick up. They began airing it in April 2014 and have aired it periodically since. The promo for the documentary is something like: "Did you know that Appalachians have been making molasses for a hundred and fifty years? And that molasses served as a primary sweetener for Appalachians for a hundred years? Or that the product of a stir-off may not really be molasses? Or how Alan Pinkerton fits in? Watch Sugar Cane, Sorghum, and Stir-offs for the answer to these and other questions." For those who can't access KET, the documentary is on this web-site as well. Just go to the video page and choose documentaries, or click here. There were once almost 4 billion American chestnuts and they were among the largest, tallest, and fastest-growing trees in the eastern forest. The wood was long-lasting, straight-grained, and suitable for furniture, fencing, and building. The nuts fed billions of birds and animals. It was almost a perfect tree - that is, until it was killed by a blight a century ago. That blight has been called the greatest ecological disaster to strike the world's forests in all of history. A tree that had survived all adversaries for 40 million years had disappeared within 40. The documentary about this loss has been airing regularly since June 2010. On Saturday, 22 September, fourteen Berea students, two parents, and four faculty/staff members came to Eastern Kentucky to learn traditional Appalachian skills. The students, Andy Brown, Amanda Burns, Kendal Carter, Aja Croteau, Claire David, Eva Griffin, Brad Niederriter, Ric Reichart, Yoshua Reece, Jarrett Robertson, Carolyn Romano, Becca Shaw, Corey Smith, and Matthew Woodward (along with Matthew's parents, Rita and Scott) are part of a Sustainability class taught by Professor Richard Olson of Berea. Berea faculty/staff were represented by Professor Olson, Cheyenne Olson, Chair Peter Hackbert, and Louisa Summers. This is the fifth or sixth of these Skills Days, which generally take place in September or October each year. The annual event is organized by Dean and Nina Cornett, and hosted by John and Dorothy Back. This year the skills demonstrated included preserving fish by smoking (Dean Cornett) and green beans by threading, hanging, and drying (Nina Cornett), producing maple syrup from tree tapping to the final product (Lee Cornett), making soap (Jim Haynes), making hominy from shelled corn (Jim Haynes), and Appalachian story-telling (Richard Smith). The event also included home-cooked meals with traditional Appalachian desserts such as stack cake and dutch-oven cake, and music by John Back, Dorothy Back,and Hugo Back. See Photos Section for more photos of event. We had a really neat thing happen to us. Videomaker magazine is carrying an article about us in their Reader Profile section of their August 2012 issue. I'm not sure if you can access the article without a subscription to the magazine, but the website address is www.videomaker.com/article/15548 in case you're interested enough to give it a try. 10 July 2102: Land, Air, and Water magazine, the quarterly publication of the Kentucky Environment and Natural Resources Cabinet, is carrying a story on page 19 about the 2112Environmental Awards mentioned below. 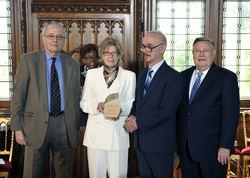 13 April 2012: The Kentucky Environmental Quality Commission, which annually honors Kentucky individuals and organizations for outstanding environmental stewardship, in 2012 presented a Lifetime Achievement Award to Dean and Nina Cornett. The awards presentation took place on Friday, 13 April 2012 at twelve noon at the Berry Hill Mansion, 700 Louisville Road, Frankfort, KY. Bobbie Ann Mason, noted Kentucky author, offered the keynote address at the ceremony, which was open to the public. - Producing videos on environmental and Appalachian subjects, including one about the bears in an eastern Kentucky park (The Bears of Kingdom Come) and a second about the demise of the American Chestnut (American Chestnut: Appalachian Apocalypse) which has aired on both Kentucky and New England PBS stations, and will next air on KET-KY on Saturday, 21 April 2012 at 9:30 p.m. The annual awards, which were instituted in connection with Earth Day, generally are presented each April. This year the presentation took place about a week before an Appalachian Skills Festival organized by the Cornetts and Berea College Sustainability faculty and students. That Festival, featuring a number of Eastern Kentucky residents demonstrating traditional Appalachian skills, was scheduled between 11 a.m. and 4 p.m on Saturday, 21 April 2012 in front of Fairchild Hall on the Berea College campus, and will be followed by music. For more information about the Cornetts, their environmental efforts, and their environmental videos, visit the following web sites:http://www.ecooutpost.org or http://timbertheft.weebly.com, or call 606-633-9546. 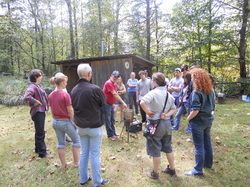 On a beautiful Saturday in October, a group of Berea College students, accompanied by Professor Richard Olson, Cheyenne Olson of the college staff, and a faculty member from Wayne State University in Detroit came to Eastern Kentucky to observe traditional Appalachian skills. The students are part of a Sustainability class taught by Professor Olson of Berea. This is the fourth or fifth of these Skills Days, which generally take place in September or October each year. The event is organized by Dean and Nina Cornett of Eco-Outpost and hosted by John and Dorothy Back at their mountain cabin. The skills demonstrated included using traditional hand tools to shuck and shell corn,grind the kernels into corn meal and use the dried shucks to make a corn shuck mattress, making soap, making hominy from shelled corn, caning a chair seat with hickory bark, using a shaving horse (a traditional hand tool) to make furniture legs. and threading, hanging, and drying green beans for winter. The day also included Appalachian stories, music, and food, including stack cake and fried pies.The demonstrators included John Back, Randy Campbell, Bill and Billie Jo Caudill, Nina Cornett, Jim Haynes, and Richard Smith, along with a supporting cast. The music was provided by John Back, Dorothy Back, Hugo Back and some of the students, and Richard Smith was the story teller.